Voting is one of our nation's most fundamental rights and a hallmark of our democracy. Voting in-person on Election Day is the way most Americans cast their ballot and vote, but for far too long, many voters with disabilities who use wheelchairs or other mobility devices have had difficulties getting inside polling places to vote because of architectural barriers. Title II of the Americans with Disabilities Act (ADA) requires public entities to ensure that people with disabilities can access and use their voting facilities. This publication provides a brief discussion of physical barriers to access in five commonly found areas at polling places: parking, sidewalks and walkways, building entrances, interior hallways, and the voting area itself. It is intended to assist election officials to meet their ADA obligation to provide polling places that are accessible to and usable by individuals with disabilities. To provide access to the polling place, a route into and through the polling place must be accessible to voters with disabilities. This accessible route should connect each area, from parking to the voting area and back again and should be the same route all voters take. If this is not possible and alternate routes must be used to provide access for voters with disabilities, temporary signs should direct voters to and along these alternate accessible routes. While locating polling places in accessible facilities makes ADA compliance more likely, there may be times when that is not possible and the use of temporary measures to provide access will be necessary. While permanently removing architectural barriers is preferable, this document provides some low-cost, temporary solutions that can provide temporary access for people with disabilities on Election Day. Temporary measures may not be suitable for every polling place that has physical barriers that block access. 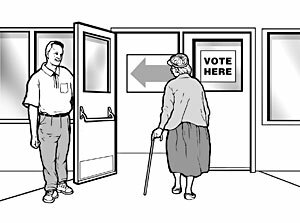 For example, if the only entrance door at a polling place is 29 inches wide, then propping the door open or providing a doorbell for a poll worker to open the door will still not allow a person using a wheelchair or a walker to pass through the door. If another accessible entrance is not available, the door must either be permanently modified or the polling place must be relocated to an accessible facility. Many polling places provide parking for voters but the provision of accessible parking is often overlooked. 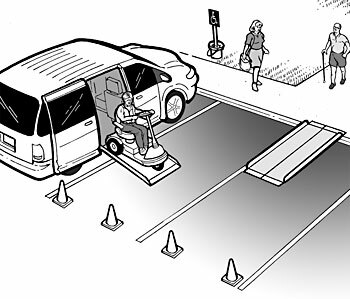 Parking areas may lack accessible parking spaces with adequate access aisles and signs, or may be on a sloped surface. Also, because other entrances – not the main entrance to the building – are commonly used as entry points to the polling place, especially at large facilities such as schools, permanent accessible parking may not be close to the entrance to the voting area. 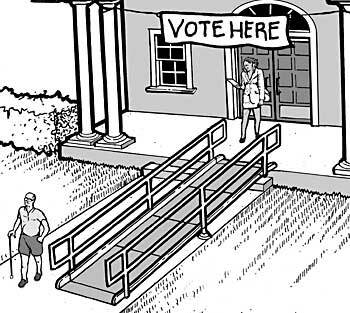 All of these barriers can prevent voters with disabilities from reaching the polling place. Parking provided at the polling place must meet specific minimum width requirements for spaces and access aisles so voters with mobility disabilities can get out of their car or van. Generally, the access aisle must be of at least 60 inches wide for cars and 96 inches wide for vans. Van spaces can also have an access aisle at least 60 inches if the width of the van parking space is at least 132 inches. A sign, with the International Symbol of Accessibility, must mark each accessible parking space. Van-accessible spaces must be designated as such on the sign at these spaces. If only one accessible space is provided, it must be a van-accessible space. 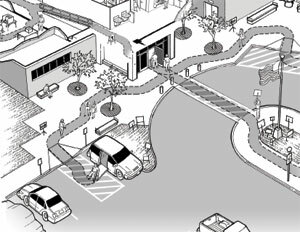 Accessible parking spaces must be in a level area with no steep slopes and on the shortest accessible route from parking to the accessible entrance to the polling place. Temporary parking must be located on the most level area available and as close to the accessible entrance as possible. Traffic cones and portable signs can be used to create accessible parking spaces and access aisles. If sidewalks and walkways are in disrepair, it can be difficult, and sometimes impossible, for a voter using a wheelchair or other mobility device to safely navigate to the polling place. 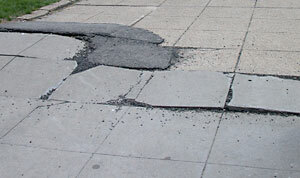 Often, sidewalks and walkways are uneven, cracked, or contain potholes, gravel, dirt, or grass. Some sidewalks do not include curb ramps or, if they do, the ramped section is too narrow or steep. Sidewalk or walkway surfaces must be at least 36 inches wide, without abrupt level changes (no level change greater than ½ inch), and the surface must be stable, firm, and slip resistant. Curb ramps should not be too steep (no steeper than 1:12). Temporary plates (no more than ½ inch thick) can be used to cover holes or cracks and provide a more level walkway. Ramps at least 36 inches wide, with a slope no more than 1:12, may be used to provide temporary access over curbs or onto sidewalks. The entrance area must be level (no level change greater than ½ inch) and should not slope steeply in any one direction. All door openings must provide a minimum width of 32 inches and there must also be enough room for a person using a wheelchair to maneuver to open the door, including 18 inches of clear space beyond the latch side of the door. Additionally, the door hardware must not require tight grasping, pinching, or twisting, and the height of the door threshold must not be greater than ½ inch. The use of temporary ramps can provide access over steps or high thresholds. 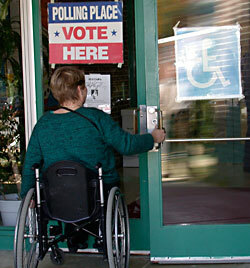 If the area in front of the door is not level or does not provide adequate maneuvering space, then the door may be propped open to allow the person using a wheelchair to enter the polling place. If one door of a double-leaf door is not wide enough, propping open the second door may provide enough clearance. In some circumstances, temporary levers or other adapters that do not require tight grasping, pinching, or twisting, may be installed over existing door hardware to provide independent access. Alternatively, a temporary doorbell or buzzer system may be used to alert a poll worker to open the door or doors for the voter. In many polling places, particularly those in large facilities such as schools and apartment buildings, hallways contain drinking fountains, coat racks, fire extinguishers, and other protruding objects. These objects may pose hazards to voters with vision disabilities, who may bump into them if they are not detectable by a sweep of a cane. Wall-mounted objects located between 27 inches and 80 inches above the floor may not protrude or stick out from the wall more than 4 inches. Place traffic cones or other cane-detectable barriers, such as planters or portable railings, at or under protruding objects. 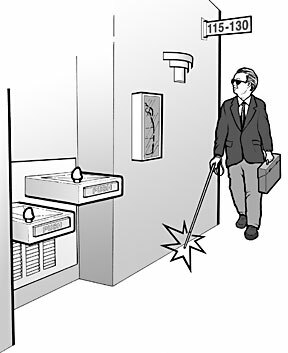 Cane-detectable barriers can also be placed to re-direct voters with vision disabilities around or away from the protruding object. An alternate pedestrian route that does not include the protruding object, if available, may be appropriate. 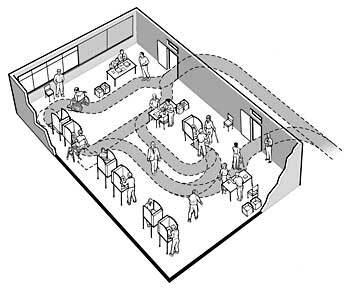 Voting often occurs in a small room or area within a building, with little space at the check-in tables and voting machines, making it difficult for voters with mobility disabilities to move through the voting area and cast their ballots. In winter months or during the rainy season, election officials may use cardboard, plastic floor coverings, tarps, or mats to cover the floor. These coverings can make it difficult to navigate and can easily become trip hazards for voters with disabilities and others. There must be a minimum 36 inch wide route in and through the voting area. There also must be enough clear floor space in at least one voting station or booth to allow a voter using a wheelchair or other mobility device to approach, maneuver, and leave the voting station. Floor surfaces must be stable, firm, and slip resistant. Arrange check-in tables and voting stations to provide an accessible path for the voter to go from the check-in table to the voting station and out again. 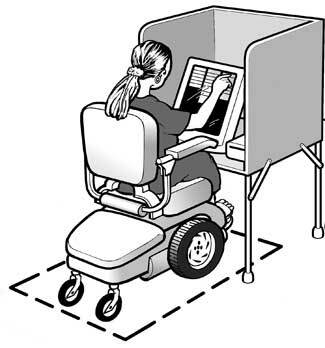 At least one voting station should provide at least 30 x 48 inches of clear floor space to allow a voter using a wheelchair or other mobility device to maneuver. All floor coverings, such as cardboard or plastic sheets, should be removed or firmly affixed to the floor to provide a stable and slip-resistant floor. To provide temporary access to voters with disabilities, election officials should always keep in mind the accessible route into and through the polling place. Understanding how all voters arrive at the polls, park or drop people off, move through the facility and the voting area, and back out again will help identify physical barriers that will need to be remediated. Using the tools discussed in this document can provide temporary access and will ensure that voters with disabilities can fully participate in the election process. This document provides guidance on providing temporary access to polling places. Election officials should note that the ADA requires jurisdictions to select polling sites that are accessible or can be made accessible for elections. The ADA title II regulation and the ADA Standards for Accessible Design set out what makes a facility accessible and should be used to determine the level of accessibility at each facility being used or considered for use as a polling place. Election officials should consult the Justice Department’s ADA Checklist for Polling Places for more detailed guidance on how to assess whether a polling place is fully accessible to voters with disabilities or if barriers can be removed. In addition, election officials should consult the Department’s 7-page publication on the rights of voters with disabilities, The Americans with Disabilities Act and Other Federal Laws Protecting the Rights of Voters with Disabilities, also available at www.ada.gov. For information about the ADA, please visit our website or call our toll-free number. Th 12:30 p.m. – 5:30 p.m. (Eastern Time) to speak with an ADA Specialist. All calls are confidential. To receive e-mail notifications when new ADA information is available, visit the ADA Website’s home page and click the link near the lower right corner of the page.